There are a lot of great geographic information systems (GIS) that run in web browsers and mobile apps, thanks in large part to the introduction of new web standards in 2010-11 and recent improvements in mobile devices. And yet, most existing GIS systems are half-built systems that require setup by the users, which can be difficult and inconvenient to common for users who don't know how to code. There's also a very limited range of free and open source options for scientific data analysis. We created OpenWebGIS in 2014 to address all of these issues in a single, ready-built solution. 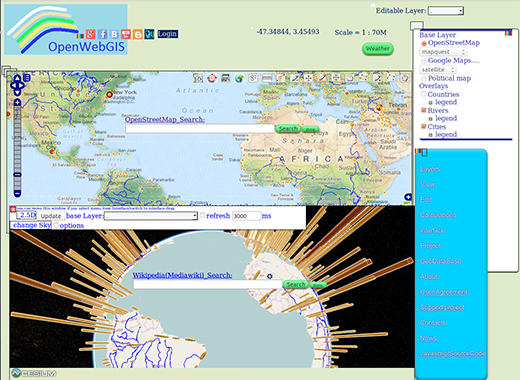 The OpenWebGIS interface with a few user modifications and a 3D view. 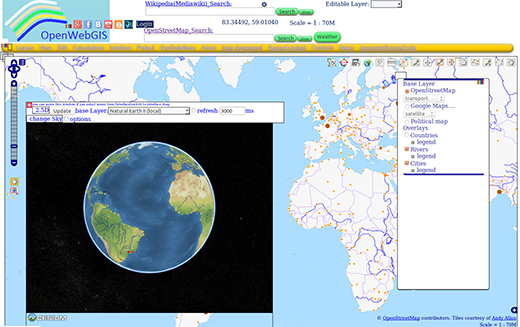 OpenWebGIS is an open source online and offline GIS that can be used in both web browsers and mobile apps. Extrude images to 2D vector, 2.5D, and 3D layers on the map. Obtain spatial and temporal distribution of earthquakes all over the world. Get the spatial distribution and brief description of paleontologic occurrences all over the world. Track satellites and the International Space Station (both in real time and for any period of time). Get weather data for a region. Convert any vector layer to shapefile. Image analysis, segmentation of regions by colors and vectorization. Geolocating your own position and the position of other people or objects (that are connected to OpenWebGIS). Create fractals on the map. Select data from Wikipedia or OpenStreetMap and map it. Use sensors and Wi-Fi statistics from an Android mobile device and refer data to geographic coordinates. You can find detailed information about OpenWebGIS features and applications on our blog. The main goal of OpenWebGIS development is to create a GIS with all the standard functions of online web GIS systems, a powerful set of tools for data scientific analysis, and features that are interesting to a wide range of users (not just scientists). We want OpenWebGIS to become an accomplished Software as a Service (SaaS) cloud computing platform, and enable users to be able to deploy their own server and client instances. There are some flaws in OpenWebGIS, but there's also great potential. With your help, we can make it more functional, usable, user friendly, and powerful. We're always open to your requests, comments, and suggestions. You can contribute to the OpenWebGIS code on GitHub. Code for the Android app is also on GitHub. If you're multilingual, we also need help with interface translation. Redesigning the interface. We want to introduce a few variants the user can choose from. Another important part of the work will be improving the experience for mobile users. Optimizating for various browsers. Right now, the system runs without any problems in Mozilla Firefox and Google Chrome. 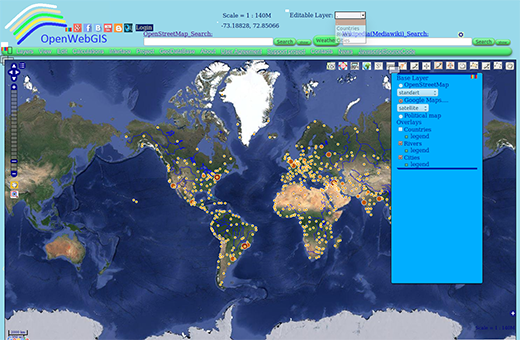 Organizing, selecting, and mapping data from the huge amount of open geodatabases. Translating the interface with help from users. You can try OpenWebGIS online right now. 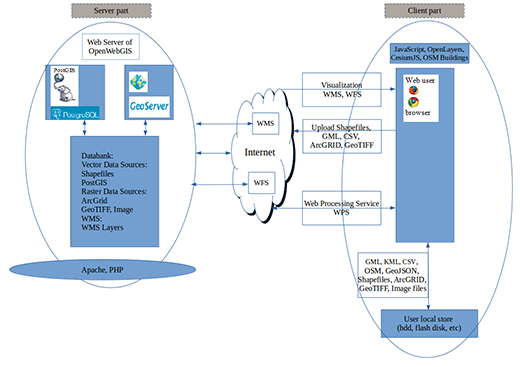 The structure of OpenWebGIS is divided on server and client parts. The client part can function both online and offline. We call the client part the OpenWebGIS local version. Some functions (such as selecting from Wikipedia and OpenStreetMap) do not work in this version, but we expect this to change in the future. To run this version, download the source code from GitHub, unzip it to any of your folders, and launch the file Start_OpenWebGIS_en.html in your browser. The Android version (an app .apk file) is also available on GitHub. To deploy your own fully functional server instance of OpenWebGIS on the desktop, you must install Geoserver, PHP, Apache (or other web server software), PostgreSQL, and PostGIS. Copy the source code from GitHub and configure access for software listed above to the folder that contains this source code. Fedor Kolomeyko - Fedor Kolomeyko graduated from technical university, finished graduate school. He has wide experience in scientific organization. Now he works as a head of the programmers team in the field of databases and GIS. He is a developer of OpenWebGIS. It is an open source Geographic information system. These guys are in desperate need of a UI designer, the site makes my brain cry. Too much cognitive friction. No alignment, different size buttons, menus seem to be based on Windows 3.1 :) When I see interfaces like this, the quality of the back-end is a big question. Looks exactly like what we have been looking for! So would this intended to be roughly analogs to ArcGIS online, or are there differences in intended scope & function? I have heard some talk about ArcGIS online as a big endeavor form the proprietary player currently dominating most GIS markets. Whatever the intended function of your system, it's great to know someone is working on a free & open alternative in a similar space. Thank you for feedback. The goal of OpenWebGIS developing is to create a free and open system which will be a web based GIS, similar in functionality to full-functionality (universal) desktop GIS.